Bold Street is a mecca for alternative and vintage fashion, lined with independent stores and Pop Boutique is a shining example of what is possible for anyone setting up a vintage shop. This beacon of vintage fashion began life as a Camden market stall in the 1970s. 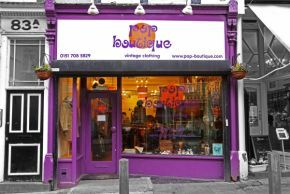 Fast forward 30 years and the name Pop Boutique is one of the most popular vintage outlets in Liverpool. Boasting two stores in the city on Whitechapel and Bold Street, they set themselves apart by selling vintage clothing alongside their own brand label, Pop, which is a big step up from the Camden days of founder Richard Free. Bold Street store manager Peter Allan credits the store's own label for their success. He said: "That mix of our own brand and vintage, you know, I don't think anybody does that in Liverpool." The store is bursting with colourful clothes surrounded by quirky decor from antlers to vinyls, not forgetting the antique globe minibar displayed proudly in the window. Expect to find only the highest quality vintage items when you step foot in Pop Boutique. All clothes go through strict a grading process, before being handpicked, steamed and pressed at the warehouse before arrival. He said: "We have a girl in the warehouse who picks out the things that she thinks will sell well. Even between Whitechapel and Bold Street the things that sell are completely different. "At the Whitechapel store we sell a lot of sparkly things and here it's near the student area, so we sell a lot of crew sweats and stuff like that." Like all the rarest gems, being unique is a must. Choosing vintage over high-street means there's no chance of bumping into someone in a matching ensemble. Peter added: "No one else is going to have the same outfit as you. If you go out in a Topshop dress, you'll see three girls wearing the same one." Pop Boutique sells old vintage pieces of course, but stays on trend by incorporating 90's clothes too. You're likely to find something to suit you whatever your style as the store caters to everyone regardless of their personal style. Peter explained: "With vintage, we don't have just one style, there's a mixture. 90's trends have been huge recently but our clientele goes from 13-year-olds buying crew sweats to 60-year-olds buying fur coats. So yeah, there's definitely not just one style." Being an independent business isn't always an easy ride, keeping prices low while not having the financial backing of a major corporate chain, can at times be a struggle and the area is 'quite transient' so can be affected. Even if vintage clothing isn't usually your thing, Pop Boutique is a great place to start. The staff are friendly and on hand to help, whether you just need some inspiration or a whole outfit idea. To keep up to date with all the latest Pop news, you can find them on Facebook and Twitter.